Place tilapia on the skillet and cook until the flesh starts to flake. Add jalapeño peppers, tomatoes, cilantro and lime juice. Sauté over medium-high heat for about 5 minutes, breaking up the fish with the spoon to get everything mixed well; season to taste with salt and pepper. Meanwhile, heat tortillas on a skillet a few minutes on each side to warm (no oil needed). 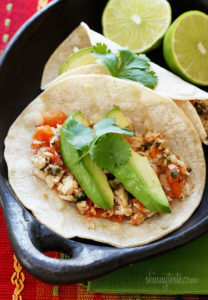 Serve a little over 1/4 cup of fish on each warmed tortillas with a slice or 2 of avocado and enjoy! I like it spicy, so I chop up the jalapeños whole, seeds and all but you can tone it down to suit your taste.